Seven dollars of a $60 video game purchase covers expenses for games never even sold. That's according to a breakdown of retail game cost by an on-demand games service. OnLive, of Palo Alto, Calif., says that $7 covers, on average, "returns." That's the cost associated with returning unsold inventory - essentially, sales that don't meet expectations. 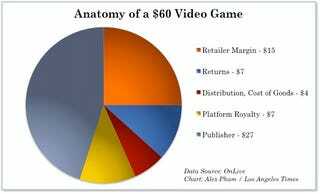 By this analysis it is equivalent to the royalty paid to the platform holder - Nintendo, Microsoft or Sony. By far the largest portion is to the publisher, nearly half of it. As it should be. But 25 percent of a game's cost is the profit to the seller. That is a very nice margin, and it - plus the fudge factor on the returns, hint at how discounts on some new games can be justified even at release.